Ant-Man is a refreshing new chapter from the Marvel Cinematic Universe that has the feel of Guardians of the Galaxy, but with one man instead of an entire team of heroes. Directed by Peyton Reed (Yes Man, The Break-Up), he pulls off a great vision translated to screen. I wasn't sure what to expect from this new MCU movie, so I kicked back and let the film roll. We watched Scott Lang (Paul Rudd) getting out of jail for getting caught after having "burgaled" a large corporation. He swears to go straight upon his release, but he's desperate to get back to his daughter who is in the custody of his ex-wife and her fiancee. As one thing leads to another, he starts considering his old ways of life because no one wants to hire an ex-con. 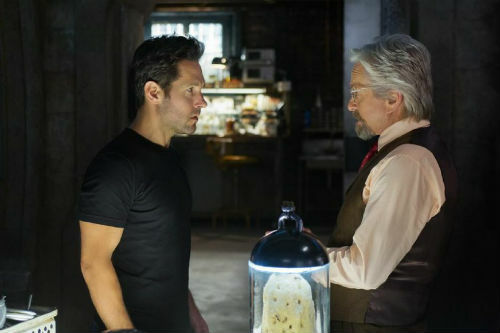 In the mean time, we got a dose of what Hank Pym (Michael Douglas) has done and how he feels about his molecular shrinking technology called Pym Particles and how they helped him create Ant-Man. But he does not want anyone having his technology. Plus there are some other angsts he holds, but that's for another discussion. 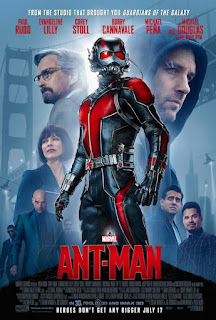 After many years of effort, his protege, Darren Cross (Corey Stoll) discovers how to make the technology work and and Pym, fearing the worst for the tech falling into the wrong hands, sort of finagles Scott into breaking into his old company that Cross now runs, to steal the tech. Pym employs his daughter, Hope van Dyne (Evangeline Lilly) to help train Scott for this daunting task. With a man concerned about his technology, a daughter who thinks she's capable of pulling the stunt, and an out of work ex-con jumping at the chance for redemption, while they face off against an enemy who has no moral compass, the story makes for a great introduction to a popular B or C-level Marvel character that was first heralded by Edgar Wright, and then adopted to screen by Marvel. I've not seen too much of Paul Rudd's work but what I saw in Ant-Man, I liked. Edgar Wright penned the original story script and after a few years of pitching it, with fan support, Marvel decided to go with making this movie. Along the way Marvel and Wright did not see eye-to-eye on the creative direction the story had, and Wright stepped down and let Joe Cornish, Adam McKay and Paul Rudd retool the story with Reed directing. Wright does some fun stuff and I would have loved to have seen what he had in mind, but Marvel is the one with the vision and they did fine by me. One character that did bring the comedy was Michael Pena's Luis. The guy who knows a guy. Luis is an old criminal acquaintance of Lang's and they end up working together, for a good cause. It was nice to see yet again, Hayley Atwell as Peggy Carter but no, not present day, but rather, in a flashback, from the 80's, when Pym and SHIELD have words in a flashback, about his particles. And there is one other character that I am loathe to name, that was a pure pleasure to see in the film. 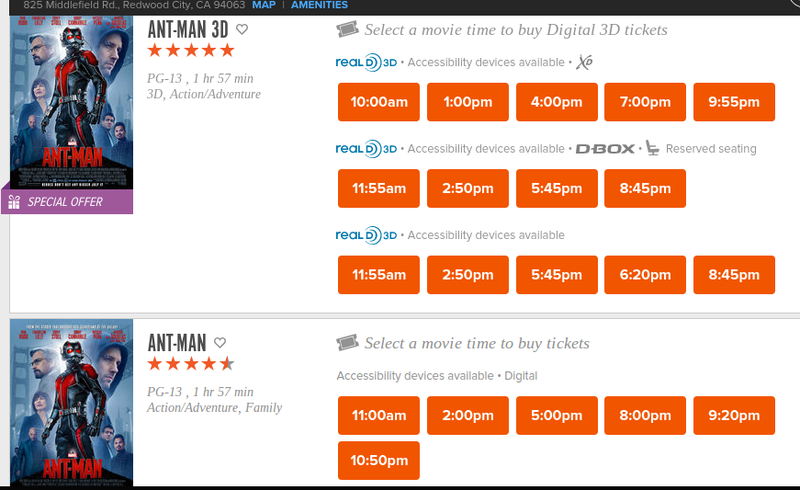 Trust me... if you go into this movie unspoiled, you will love it. Overall, I found my movie experience entertaining and some of the leaps of faith and logic stretches weren't too horrible at all, but they were there. But they did help sell different points in the story. On a scale of 1 to 10, I'd say the film is not a waste of money, no matter how much you might want to or are forced to spend to see it. 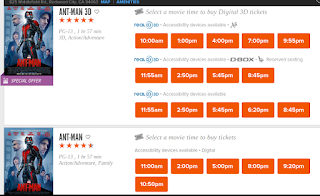 (I had ZERO options and watched the movie in a $16 10AM morning matinee 3D, XD screening). The 3D was fine. There were moments it shined but 2D would have mostly worked with the story too. Oh, yea, that scale... I'd safely say a popcorn 8 for easily.